Air conditioner compressor is used to remove the heat-laden vapor refrigerant from the evaporator of the air conditioning systems. In layman term, the compressor compresses or squeezes the vapor into a smaller volume at high temperature. 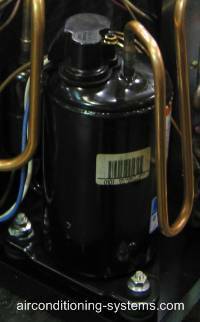 The external-drive compressor has a crankshaft that is driven by a pulley and belt system. An electric motor can also be used to drive it directly. The hermetic compressor has a motor which is sealed inside a housing with the compressor, hence a crankshaft seal is not required. The motor rotor is located either at the top or bottom of the unit. The reciprocating compressor uses piston to compressor the refrigerant driven by a crankshaft in a straight line back and forth motion. This rotary motion is achieved by the use of an electric motor and the construction is quite similar to that of an automobile engine. The piston moves up and down inside a cylinder. Vapor from the suction line is moved through the intake valve as the piston move downward. As the piston moves upward, it compresses the vapor refrigerant which is then pushed through the exhaust valve into the condenser. A scroll compressor has one fixed scroll which remains stationary and another moving or orbiting scroll that rotates through the use of swing link. When this happens, the pockets of refrigerant between the two scroll are slowly pushed to the center of the two scrolls causing the reduction of the volume of the gas. It is then discharged though the center port to the condenser. The advantage of scroll compressor is that it has fewer moving parts and less torque variation compared to the reciprocating compressor. This advantage is translated to a smooth and quiet operation. The screw compressor uses a pair of helical rotors where it traps and compresses the gas as the rotors revolve in the cylinder. In HVAC, they are usually used in systems with 20 ton capacity and above. The male rotor and the female rotor are built inside the cylinder. The low pressure refrigerant enters one end of the compressor and the resultant high pressure refrigerant is discharged into the opposite end to the condenser. Centrifugal compressor is usually used in large capacity refrigerating system. In this compressor, the vapor is moved in a circular motion known as centrifugal force. An impeller which is a disk with radial blades spins rapidly inside this housing causing the gas to gain velocity. The main advantage of centrifugal compressor is that there are no valves, pistons or cylinders. The wearing parts that need attention are the main bearings. Find out how an inverter air conditioner works. Find out more on the types of lubricant oil used in a HVAC equipment.